Financial Planning Standards Board Ltd. (FPSB) defines financial planning as a “process of developing strategies to help people manage their financial affairs to meet life goals.” In creating their recommendations and plans, financial planners may review all relevant aspects of a client’s situation across a breadth of financial planning activities, including inter-relationships among often conflicting objectives. 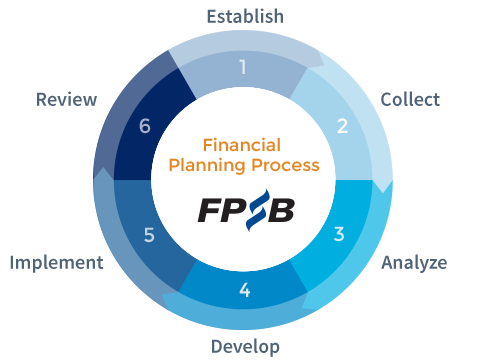 FPSB’s Financial Planning Process consist of six steps that financial planning professionals use to consider all aspects of a client’s financial situation when formulating financial planning strategies and making recommendations. Individuals who have earned the CERTIFIED FINANCIAL PLANNER certification are qualified to deliver integrated financial planning recommendations and present appropriate solutions to help consumers take control of their financial lives. FPSB and its network of member organizations around the world have certified over 175,000 individuals who have met initial and ongoing CFP certification requirements to hold themselves out as CERTIFIED FINANCIAL PLANNER professionals. To find a CFP professional near you, visit the website of the FPSB member organization in your territory.